BCCI has awarded title sponsorship rights for every domestic and international cricket match being played in India till 2019 to One97 Communication, owners of Paytm. Their bid of Rs 203.28 crore, which was 42% higher than the base price of Rs 1.7 crore enabled them to race ahead other bidders and seal the deal. Most probably, such aggressive bidding by an Indian ecommerce company showcases the hunger which this nascent industry currently experiences. This title sponsorship rights include: branding of the series with the title sponsor logo, broadcast sponsorship rights, designation as the title sponsor of the series and greater visibility at the stadiums and marketing content. And all Test matches, ODIs and T20 matches are covered under this deal. India is going to play 84 matches on it’s home front, during the next 4 years; and this means that Paytm will pay Rs 2.42 crore to BCCI for every match. This is one of the biggest sponsorship rights ever acquired by any digital company in India, as title sponsorship rights were usually bagged by mainstream companies earlier. Besides being title sponsors for International matches being played in India, Paytm will also be associated with local domestic tournaments such as Ranji Trophy, Dulip Trophy etc. Henceforth, Ranji Trophy would be called as ‘Paytm Ranji Trophy’. Paytm’s logo and branding would be clearly visible from September onwards, when South Africa visits India for home series. As per BCCI, the realization of sponsorship rights have increased by 20% compared to last year. Previous title sponsors Micromax paid Rs 2.02 crore for every match (August, 2014 – July, 2015); and before that Star India paid Rs 2 crore for every match (October 2013 to July 2014). However, Airtel still holds the record for highest amount of title sponsorship till date, as they paid Rs 3.3 crore/match between September 2010 and March 2013. 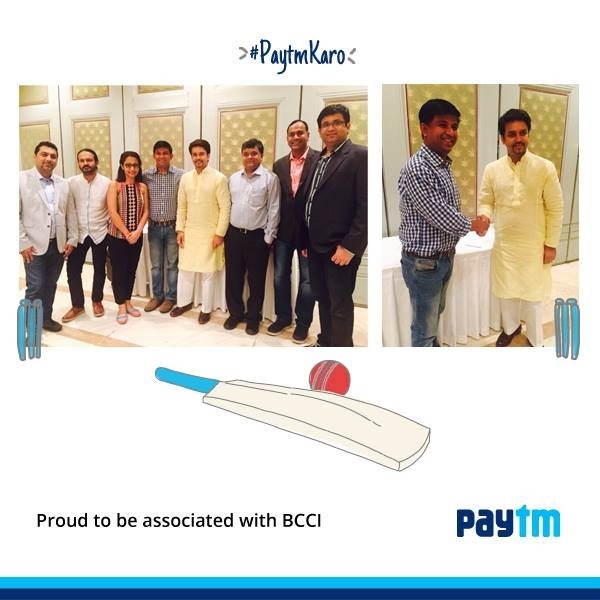 Earlier, Paytm spent Rs 50 crore to become associate sponsors of IPL. This is also for the first time that a media agency helped to finalize such a mega deal concerning cricket. Maxus, a media agency and GroupM ESP collaborated and worked together to help Paytm win the contract. Indian ecommerce is now mainstream; and if there was any doubt left, then Paytm has effortlessly removed that after securing title sponsorship for Indian cricket team. "Paytm Wins Title Sponsorship Rights For Indian Cricket Team; To Pay BCCI Rs 2.42 Cr For Every Match Till 2019", 3 out of 5 based on 5 ratings.